Is it moving forward? At the pace you want? Are you getting where you need to go? Or at least, the answer is, “Not as fast and at the level of quality I need and want.” So, here’s the most important question: Why not? The season is upon us and whether you are submitting your budget for approval or evaluating the budget requests others submit to you, we thought we might offer some insight for your process. Business school professors love to apply the latest 4 square analysis that simplifies complex industry quandaries. The marketing texts (Kotler anyone?) are full of flowcharts and other grids to help you make sense of the 4 Ps (Product, Price, Placement and Promotion). And then there is the ever-elusive ROI analysis. And the best line of all that sums up our most cynical fears: We will beat the excel spreadsheet into submission until it tells us what we want to hear. Oh, those budgeting meetings and the spreadsheet assumptions. How often do we go back at the end of the year and take a look at what we projected and what we actually achieved before we approve the next project budget? Not often enough and usually not with enough of a critical eye. Sometimes, having outside expertise performing an analysis or assessment of your processes and capacity against your strategic goals can really help move an institution forward. Send us a quick email to learn more about what Intead can do to help. Download Intead’s 3 Essential Budget Questions – a 1-pager that offers a simplified approach to considering any budget request/evaluation. With this framework for evaluating your plans and whether they merit additional investment, you’ll take those complex quandaries down to a basic starting point to help identify where the opportunities for growth really are. We think you’ll want to share this one widely. Your budget is the tactical expression of your strategy. What you value most is where you put your funds. Or at least, that is how it should be. So, you have your strategic goals handed to you based on the trustee and leadership team strategic planning process. Hopefully, they took your perspective into account since you really do know what is happening on the ground, what has worked before and what will work going forward. And you know what it takes to achieve those strategic goals. You’ve got your tactical plan to make it happen. You’ve been pushing that plan forward for how many years now? You’re not alone in struggling to execute your plans at the level you want. We all face it and nearly every academic leader we talk to shares this same frustration: “We’re not achieving as much as I know we could.” They then offer a list of what it would take. And it almost always comes down to two things: not enough focused attention and not enough funding. The Intead team took our collective experience with so many different institutional assessments and strategic planning sessions and simplified the process of budget evaluation into 3 basic questions. Our Budget Evaluation chart offers a framework as you develop your rationale for why a particular project deserves funding. It assumes your strategic goals are already established. Increasing enrollment from whichever student segment your institution serves best: domestic, international, non-traditional, graduate certificate, online...wherever you want to grow, Intead can help. Take a look at the chart and perhaps it will organize your thinking for the deeper analysis that fully justifies your budgetary commitments. 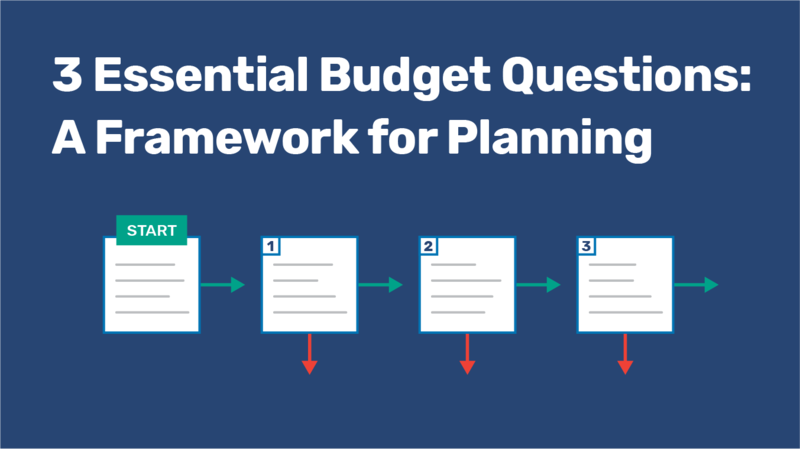 Let us know what you think and whether this flowchart is helpful to your budget evaluation process. There are so many things to consider before committing funds. Helps us take the budgeting conversation further by sharing your thoughts below.